Hello, all. Hoje eu falo e dou vários exemplos sobre alguns idioms comuníssimos do inglês que usam a palavra GUT. Hello, all. This is the new episode of the Inglesonline podcast. Please subscribe to this podcast using the Podcasts app for iPhone or iPad, or listen to the episodes using the Inglesonline Android app. Thanks for all the comments at the iTunes store and if you haven’t yet left a comment for this podcast please do so: the more comments for the Inglesonline podcast, the more people will find out about it and listen to the episodes. Thank you for telling your friends, your neighbours, your family and keep listening. So let’s move on to a very interesting idiom: gut feeling. That does not mean having a sick stomach, or having a bad feeling associated with your stomach. A gut feeling is an intuitive feeling. It’s something you know, and sometimes you can’t explain why you know it or where it came from. Some people call it intuition, some call it instinct, and other people call it divine guidance. Whatever you call it, when you have a gut feeling about something… I, personally, would recommend that you listen to it. I don’t know about you, but when I have a gut feeling about something, it’s usually right. And, honestly, sometimes I regret not listening to it. I think there have been times when… I felt pressured to take a particular course of action that was the opposite of what my gut was telling me. I can tell you that I always regret going against my gut, or not listening to my gut. OK, so, as you can see, we can just use the word “gut” – listen to your gut, listen to what your gut says, go with your gut. When people say something like that – go with your gut, they’re saying “If you’ve got a gut feeling about this, trust it.” What’s your gut feeling about this, or that? Deep down, in your gut, what do you think will happen? So I totally agree when someone says “when in doubt, go with your gut”. Do what feels right. This is a very common phrase: go with your gut. If someone tells you they were faced with a difficult situation and didn’t really know what to do but then decided to go with their gut… Perhaps they ended up making a decision that was not what everyone expected, but it felt right because they went with their gut. They had a gut feeling about it and they listened to it. Now, can you guess what a gut reaction is? 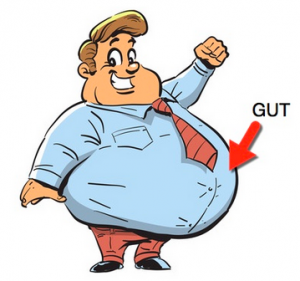 This is another great term with the word gut. Your gut reaction is your immediate, instinctive reaction to something. Before you have time to think, before you’re influenced by other people’s reactions… A gut reaction is your true, genuine reaction. If someone says “What is your gut reaction to this? Please give me your gut reaction”, that means they wanna know your immediate thoughts on something, before you have time to choose your words. Just give me your gut reaction. No sugarcoating. Don’t mince your words. I want your gut reaction. So I am sure everyone has plenty of experience with following or not following their gut. I wanna hear your stories. Did you follow your gut in this particular occasion? Did you not follow your gut? How did it turn out? Talk to you next time! I always taught my children follow their own intuition, I used to write a number and I’ve asked them to say what it was just giving me their gut reaction! And now they grew up and they have successful job, everyone trust them a lot! That’s interesting – you basically wanted them to develop their intuition, no? I really like your text. Thank you Ana! It is wonderful share your knowledge! You are the best! Hi Ana! About gut feelings, I think that it is something we should always listen to. There’s some part into us that, for some reason, know what is the best for us. I believe in it. That is a great exemplo. I’m not a mother, but that seems to be true.. no? What if your guts keeps holding you back from becoming a fluent English learner, for example? In this case, would be advisable to go into your guts, even when we realize most of them are limiting beliefs that prevent us from achieving our goals? In this case I would not call it “my gut”… More like ‘limiting beliefs’ as you called them..